With its outstanding image quality, the VPL-FX500L delivers amazing installation flexibility and trouble-free maintenance in challenging installations. The projector also offers peace of mind with its twin-lamp system which eliminates downtime. This VPL-FX500L has a very wide lens shift range, enabling excellent flexibility when installing the unit. Lamp and air filter maintenance cycles are synchronised and are exceptionally long compared to single and dual-lamp systems, cutting maintenance time and cost. In addition, the projector is designed to deliver a low total cost of ownership, and includes eco-friendly features such as long-lasting lamps and low power consumption. Packing the most advanced projector technologies into an unobstrusive design, the VPL-FX500L is an excellent choice, delivering a dramatic brightness of 7,000 lumens and high-quality images with XGA resolution. 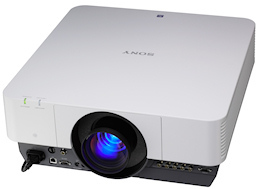 High Picture Quality and Bright Images By combining a new-generation optical system that uses Sony’s BrightEra™ Long Lasting Optics technology* and a 3LCD projection system, the VPL-FX500L offers high picture quality in XGA (1024 x 768) resolution and a high brightness of 7000 lumens. The optional VPLL-Z4015, VPLL-Z4019, VPLL-Z4025 and VPLL-Z4045 are known as All Range Crisp Focus (ARC-F) lenses. Each with a large diameter and fine pitch, they ensure crisp pictures. The VPL-FX500L’s twin-lamp system provides peace of mind and economical operation. One lamp can output a total of 7,000 lumens but a second lamp is built in to provide automatic backup should the primary lamp fail. The two lamps can be alternately used, achieving a recommended lamp replacement time of approximately 8,000 hours, saving maintenance time and cost. The VPL-FX500L is equipped with a lens shift function which is controlled from the projector control panel or the supplied Remote Commander unit. Using this function, the position of the projected image can be moved vertically by -96% to +96% and horizontally by -64% to +64%. Images can be easily adjusted to the desired settings during installation. Lamps can blow, if you need your projector working and can't afford down time, you may need to keep a spare lamp. The replacement projector lamp for the Sony VPL-FX500L is the LMP-F330.